This introduction to professional toenail clipping is intended for healthcare professionals who are interested in training to provide foot care for seniors. The fundamentals of toenail clipping are a prerequisite for our hands-on class, and nurses should not practice these techniques without training and practice. All of our instructional programs are reserved for professional nurses who are training to provide medically appropriate routine foot care to patients. Routine foot care requires only a few instruments. There are a variety of clippers available, from clippers with a c-shape blade to pointed blade clippers. 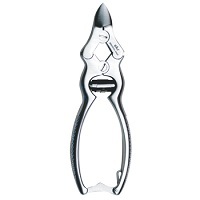 The clippers most often seen in foot care are double-action clippers. These have two hinges, which provide a mechanical advantage, however, no clipper is ultimately superior to another. The difference in these clippers will be your ability to use them properly. No matter which you choose, continue to practice to perfect your technique. Whether or not you choose floor-grade stainless steel or operating room (high-grade) stainless steel clippers should only depend on your location. If you are a Canadian nurse, you must use high-grade stainless steel in your practice. Both of these types of stainless steel can be sterilized in the same way, and are both equally medically appropriate. The difference is that high-grade steel is softer, which provides a better edge. However, this also causes dullness over time. Floor-grade steel clippers will never dull and do not need sharpening. This tool can sometimes be seen used by pedicurists. Although the curette has two scooped ends, making it ideal for cleaning under the nail, as foot care nurses, our priority is not aesthetics. For example, as a foot care nurse, you won't be pushing back the cuticle, which provides a protective barrier against bacteria. The ideal curette is double-ended: 2.5mm & 3.5mm cups. We'll outline how to use the curette below. Many nurses in the U.S. do not learn to use this instrument, although it’s quite popular in Canada. And for good reason: these files work well on nail borders and have great results when the objective is to prevent ingrown nails. Blacks files allow for thinning and rounding, and come in a wide variety of shapes and coarseness. The purpose of routine foot care is to help patients avoid serious but preventable problems. Ingrown nails are a common affliction and often become more prevalent as patients age. Oftentimes, the type of ingrown nail you're dealing with is immediately obvious by where the redness and irritation (or paronychia), swelling or puss are located. Distal tip ingrown nails result from improper cutting, when the nail is cut but the edge of the nail under the skin is neglected. This is where the curette comes in. When rounding down the nail, it's vital to inspect both sides of the nail for remaining pieces. However, take care not to overuse the curette as it is uncomfortable for the patient. Inspect the nail briefly at the end of care. Lateral ingrown nails are caused by wide nail plates. People are born with these, and oftentimes this condition worsens with aging. When the nail plates are too wide, the nail cuts in as it grows longer. Cutting the distal edge down on a person with a wide nail plate will have no effect on the ingrown nail. No matter how you cut it, it's going to continue to be wide. Since it's impossible to sterilize this area, ingrown nails are highly susceptible to infection, no matter how clean the person. Do not soak nails like this as it only promotes infection. • Is this technique effective? • Is it medically appropriate? Many techniques previously taught - and some still prevalent in modern day textbooks, do not answer any or all of these questions in the affirmative. Here are three examples of common foot care techniques that fail the test. Even if a technique is effective, it is of no use unless it is definitive. No person can live comfortably with a stick under his or her nail or a brace on the toe. None of these techniques are medically appropriate - one might argue that this is archaic medicine. Trimming the nail is effective, definitive and medically appropriate in 2017. Trimming lasts several months and it's much less risky than any of these bizarre treatments. Significant debridement provides safety for months at a time. Warning following common signs of pressure or laceration must be identified before beginning to help you see where you'll need to take more care. 1. Remove ingrowing nail areas. 2. Shorten the nails, take most of the white portion off unless the client specifically requests it. This will keep them safe for as long as possible by reducing pressure in shoes and preventing scratching or catching. 3. Sand and remove areas of crumbled or dystrophic nails. Although the nail maybe smooth today, if it contains white areas, that indicates air under the nail, which provides the conditions for breaking or crumbling. Anticipate how the nails will grow out over the next few weeks to eliminate preventable problems. 4. Gently round nail borders to prevent ingrown nails or scratching/pressure during regrowth. Avoid creating u-shaped distal edges because as the nail grows out, they'll catch on everything. View the nail from the patient's angle, ask them if you accomplished everything they wanted, looking at the nail from the distal end and looking at it from the top will give you a new perspective. If repeated infections from ingrown toenails occurs, debridement may not be enough. Avulsion - Side of nail is removed. Nail eventually grows back. Matrixectomy - Nail is removed, skin is treated with an acid. Nail does not grown back. These are the course of treatment in a case where repeated infection occurs. Avulsion includes topical lidocaine injection. In order for lidocaine to work properly, it must be injected at the base of the toe where the nerves are, not at the tip of the toe where it'll only cause more pain. With this condition, the skin is higher in central portion of the nail. This is also true with thick toenails. When sanding and not taking this into account, bleeding is imminent. Don't treat omega nails like flat nails; don't wiggle the clipper under the nail edge. Cut at an angle that's the same as the angle of the nail. Take small 2 mm bites, move your hand, not the nail. *If the nail is completely curled into the closed position, cutting is not an option. Sand with an emery board or sander only. This neurovascular skin appendage forms from scar tissue in the nail matrix. This skin growth contains nerves and blood vessels. Touching is does not hurt, however, cutting it is like cutting your dog's nails too short. A pterygium can form hyperkeratotic tissue, which can make it even harder to see. Always assume there's a pterygium and use one of the following techniques to avoid cutting it. Clip the nail above it by avoiding the lesion below. Since the appendage is not attached to the nail, you can sand the nail overlying. Sanding is the best option because it avoids cutting. If you hit the pteryum, you scratch it at worst. How do I reach all of those odd angles without getting carpal tunnel syndrome? The intuitive way to clip is uncomfortable and doesn't provide the stability we need. Turning the clipper backward and holding it that way helps us gain control. Another advantage of this is that your two strongest fingers are at the edge of the clipper doing all of the work. This techniques is awkward at first, but is ultimately faster and less tiring.